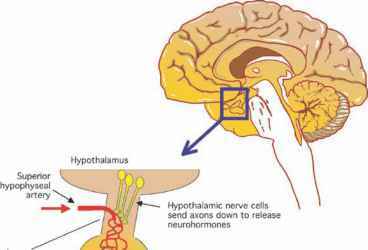 Stability of monoamine neurotransmitters in dialysate. 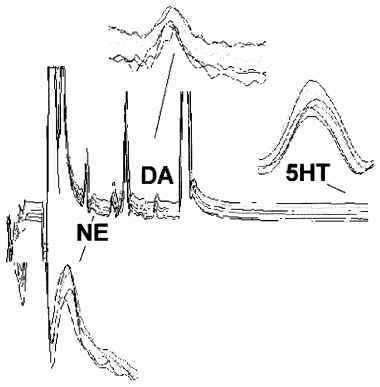 The HPLC chromatograms depict six repeated analyses of the same dialysate sample over a 4-h period and show that there is no significant degradation of the samples. is probably the most sampled analyte in dialysate because its abundance in the striatum made it very convenient to sample and analyze. But in the last 5 years, the HPLC systems have evolved considerably and now allow a simultaneous detection of norepinephrine, dopamine, and serotonin in <1 min samples from rat brain (Figure 11.7). Commercially available microbore systems allow routine analysis of 1 to 2 fM samples. Amino acid analysis systems are not as advanced, but it is possible to accurately quantify 5 to 10 min samples of neurotransmitter amino acids. Chemicals of the cholinergic system (acetylcholine and choline) as well as drugs, electrolytes, and arachidonic acid metabolites have been successfully analyzed in the dialysates.